Leading Manufacturer and Exporter of Embroidered Flags such as Religious Flags and Hand Embroidered Flags from Varanasi. These are manufactured by our skilled professionals. We are manufacture, supplier and exporter of Religious Flags. Our range of Religious flags is exclusive as we engage in making any type of flags. 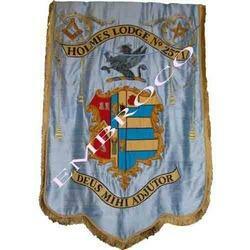 Our product Holmes lodge banner is made by skilled professionals and the material, threads used are of superior quality. We are well known for manufacturing very good religious flags. They have been maintained in the best possible manner and are have extremely vibrant colors. We encourage customized make that satisfies our customers to the fullest. 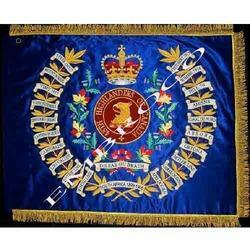 We have team of skilled professionals who are trained in Hand embroidered flags and have sufficient sewing schemes. They are made to order and our authorities have prompt service and timely delivery. They have been appreciated world wide for our techniques that we adopt. Our product is made of the best known material and the silk threads for embroidery are of the best quality. Looking for Embroidered Flags ?